STAY AT HOME MOM: WW 37 "Reinstating Brownie Vows"
WW 37 "Reinstating Brownie Vows"
What a great picture Sue! I just had to disband my troop this year and I miss it already! She is such a cutie!!! Happy WW! This is coming soon for me isn't it? I don't know if I'm ready! You should be SO proud! Scouts are such an important part of life to kids- my Webelo is proud and enjoys all his ceremonies too! What a cute picture! Happy Wordless Wednesday! Great shot. She looks so serious! My sister was a Brownie. And we've always supported the Girl Scouts cookie drive. 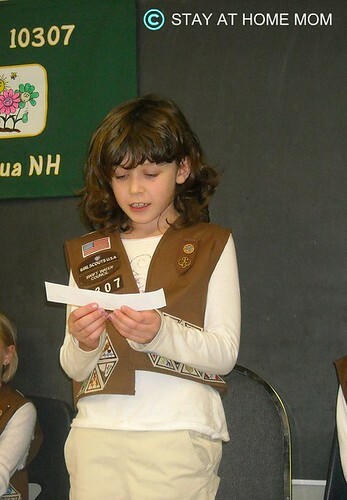 Just so sweet... my daughter was a Brownie too! Looks like she enjoys it. oh my how precious. i remember when my girls were Brownies. Even worse I remember being their leader and having hundreds and hundreds of cookie boxes in my house. Oh in all honesty I loved it. This is a great WW. That's a great shot. She looks very composed, like she could be a great debater someday! awwww! I miss those days! That is so cute. I miss being in girl scounts. I was in Daisies, I guess around 6 years old, to Juniors when I was in early high school. It's a great organization and it's so good to see they still exsist. Happy WW and thanks for stopping by my WW. She looks adorable in her little vest. Merry Christmas - Santa Baby! WW # 38 "My Daughter's Gingerbread House"
Thursday Thirteen # 16 "Heteronyms"
Holiday Eyeglass Frames Are In!